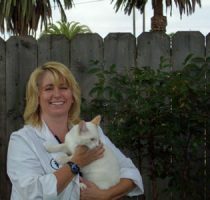 After being born and raised in the San Francisco Bay Area, I went abroad to Scotland to attend Veterinary School. I returned to California where I have been in practice for over 11 years. Four-legged residents at home include 2 cats and a dog (German Shepard), plus the no-legged ornamental fish-which keep increasing numbers by the week it seems. I thoroughly enjoy treating both dogs and cats, followed closely by exotic birds, though I am currently without a feathered companion inside the house.